The Slosberg Music Center Google calendar lists all of the classes, rehearsals and performances that will happen at the Slosberg Recital Hall. Occasionally, you will see performances listed on this calendar that may be happening elsewhere on campus. Please check the details on listings to be sure of place and time. All music students should subscribe to this calendar. 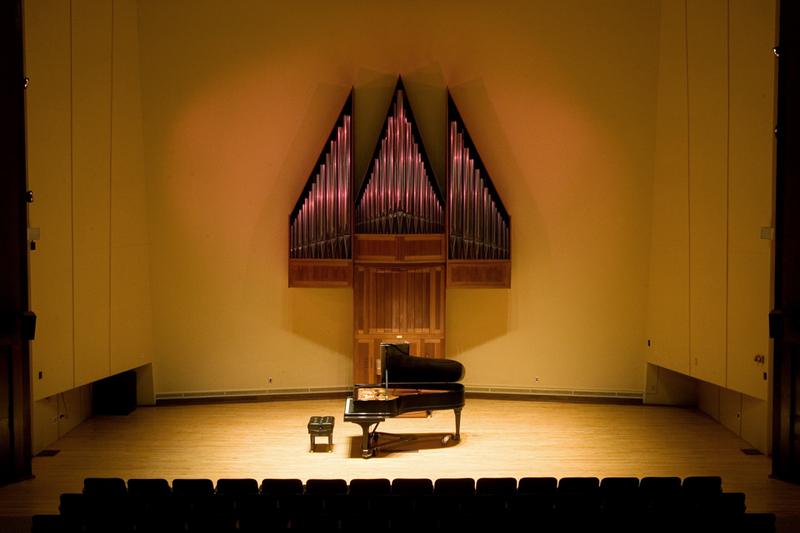 To reserve rehearsal, class or performance time in the Recital Hall, email the Concert Program Manager. Preference is given to Brandeis Department of Music majors and minors, faculty, ensembles, and then to the general public. Please check the Slosberg Music Center calendar before requesting use of the Recital Hall. All music major recital requests must be accompanied by a Recital Request Form. All non-major recital requests must be accompanied by the Petition for Non-Sponsored Student Recitals Form. All other Brandeis-affiliated hall requests must be accompanied by a Hall Request Form. Any external organizations or ensembles should email the Concert Program Manager at to discuss potential use of the hall. The Recital Hall is a "live" venue. It was created for acoustic music and needs little or no amplification. Food and drinks are not permitted in the hall. The Noack Organ has been the centerpiece of the hall since its installation in 1968.